Level 5-6 is the sixth course of Dashing Desert in Mario vs. Donkey Kong: Tipping Stars. 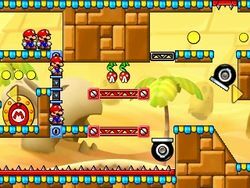 Aside from Fire Piranha Plants which generate fireballs, the level introduces a few regular Piranha Plants that are able to hold the projectiles and spit them back. The course stretches wide across a labyrinth of platforms with Red Girder and Blue Lift Rivets, as well as Cannons in various corners and an exceptionally large number of spiked surfaces. Fire Piranha Plants and Piranha Plants also reside in this level, stuck to a ceiling and a few walls. The Minis start in the left half of the course, where the Goal Door is also located inside a gapped area. In order to land into this area, the Minis have to be lured and shot from several Cannons, then bump into a Red Girder wall above the door. The M Coin is found in the right portion of the course, above a middle platform that is accessed via Red Girders. The following high scores apply in both the Nintendo 3DS and the Wii U versions of the game. The following data applies in both the Nintendo 3DS and the Wii U versions of the game. This page was last edited on September 18, 2018, at 02:53.